A chiropractor is trained and qualified in the diagnosis and treatment of problems relating to the spine, joints, and associated muscles. They are holistic practitioners who consider all aspects of your health and lifestyle before recommending a course of treatment. As well as the physical manipulation of the spine and joints to help with pain and alignment problems, they also advise on posture, exercise, and general health. What we now call chiropractic care has a long history and an ever-growing modern evidence base. At your first session, your chiropractor’s main aim is to discover the underlying cause of your symptoms. They will ask about your symptoms, medical history, and lifestyle including any exercise you take, work and posture. The first session will also involve a physical examination. You may have to expose some areas of your body, but your chiropractor will ensure this is done in a sensitive, dignified, and professional manner. If you want to bring someone with you that’s fine, or your chiropractor’s office will be able to arrange a chaperone if you call ahead. Your chiropractor might recommend diagnostic tools such as x-rays, and these are often done in-house and will be interpreted by your chiropractor. When the chiropractor has gathered as much information as they can about you and your body, they will explain exactly what they think is the problem, and what they can do to help. They will involve you in all decisions made about the plan of treatment. Your chiropractor will consider your lifestyle and recommend exercises and adjustments in posture that can help to alleviate your current symptoms and prevent further problems. As with any physical procedure, they will explain both the benefits and the possibility of any risks. 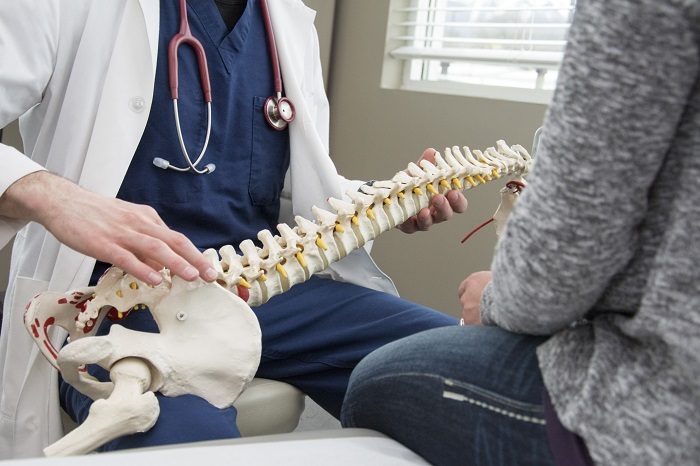 Chiropractic medicine is considered a very safe, non-invasive type of physical therapy, but your chiropractor must have informed consent to proceed and so has to know that you fully understand the treatment plan. The course of treatment will involve the chiropractor manually applying some force or movement to the spine or other joints, with the aim of relieving pain and improving mobility and quality of life. You’ll have to lie on a special table, like a massage table, for this. Your chiropractor will explain what they’re doing throughout, so there won’t be any surprises. Your chiropractor will give you an idea of how often you should see them, and how long they expect this course of treatment to go on for. This will also help you get an idea of the ongoing cost of treatment. As they’ll have performed a thorough assessment in your first meeting, the following visits will be a lot shorter. Chiropractic treatment itself shouldn’t really hurt, but you’re likely to be at the chiropractor because you’re already suffering from pain, and your chiropractor may have to handle those parts of your body which are already inflamed and sore. You should always tell your chiropractor if the treatment causes you pain or other problems. They are trying to relieve your pain, not make it worse, and can alter their treatment plan if you’re too sore. Some treatments may occasionally produce a slight clicking or popping sensation, but this is normal. Some people report the same kind of temporary ache you might feel after a sports massage. Chiropractic care is a holistic discipline, and your chiropractor will probably ask lots of questions about your health and lifestyle. This is because they need to treat you as an entire person, and not just a condition. A complicated array of things can cause back, neck, joint pain, and headaches. You may be asked about your posture, the kind of work and leisure activities you undertake, your diet, exercise, footwear, even the position you sleep in and how many pillows you use. This will help them to tailor their treatment and advice specific to you, and perhaps even to identify an avoidable root cause of your current problems. Yes; any chiropractor will have a wide variety of people under their care, with all kinds of medical conditions and from all walks of life. All chiropractors can give a full range of chiropractic treatments, though some specialize, for example in sports injuries, looking after children or the elderly, care in pregnancy or other specific patient groups. Some back and joint problems may be specific to certain groups of people, like wheelchair users or weightlifters, and some medical conditions can cause specific problems, for example, arthritis, sciatica, or osteoporosis, and so chiropractors are experienced in widely varying treatment options. Firstly, you need to work with your chiropractor and report any changes in symptoms. This can help to create a fluid, adaptive plan of care which will address new and ongoing problems as well as those identified in the first session. If your chiropractor doesn’t think they can help, or you don’t see any improvement despite your treatment sessions and following your chiropractor’s advice, then your chiropractor will recommend another type of medical intervention and possibly further investigations. Your chiropractor will have links to allied healthcare professionals like osteopaths, physiotherapists, pain specialists and radiologists, and will always refer you on to these colleagues if chiropractic treatments aren’t working for you. What kind of aftercare can I expect? Your chiropractor will tell you how long they think your treatment should go on for, and when the course of treatment ends and they feel you can be discharged from their care, they will be able to provide you with advice, information, and factsheets on keeping well: exercises, posture at work, the best ways to lift, and more. Your chiropractor may be able to give more tailored pointers now that they know you; getting you back to work, back on your bike, back into your garden or on the golf course: the aim of chiropractic treatment is to improve your quality of life, whatever that means for you as an individual.